The Style of Christian 4. On their extensive movements around Europe the Vikings encountered Christianity in different forms. At first the heathen Vikings did not have a great deal of respect for this religion. As early as 793 they plundered the famous monastery in Lindisfarne i England and the monks were killed. Other monasteries and churched met with the same fate. However, through diligent missionary work, Christianity, via the initiative of powerful European princes, was spread out all over Scandinavia. Another important factor in the spread of the new teachings was, without doubt, the extensive trade connections and the many sea connections. King Harald Bluetooth was christened in the 960´s. But before then he was already favourably disposed towards Christian priests. The archbishop in Adaldag in Hamburg-Bremen was able to choose three mission priests as early as 948. In Helmod´s “Slave Chronicle” from the 12th century, it is said that “Blessed Adaldag was the first archbishop, who ordained bishops in Denmark and from that moment the Hamburg church began to subjugate obeying churches”. The first bishops were Hored i Slesvig, Liufdag in Ribe and Reginbrand in Aarhus. So these were only Episcopal residences in Jutland, i.e. in the area, which Harald ruled at the time. We know that these three bishops at this moment in 948 participated in a bishops meeting in Ingelheim. Adam of Bremen wrote later in the 1070´s that Aldaldag ” gave them responsibility over the churches, which are on the other side of the ocean, namely in Funen and Zealand, in Scania and in the land of Sweons”. It is not easy to unravel the ecclesiastical relations in southern Scandinavia in the beginning of the 11th century. In the end of the century Adam of Bremen himself described the difficulties concerning the delimiting of the bishops´official geographical areas. “I think that the reason for this is that before Christianity settled, no bishop was assigned a certain Episcopal residence, but each one of them continued eagerly to spread Christianity further and further away, thus mutually competing to preach the word of God for their own as well as foreigners." King Sweyn Forkbeard, the son of Harald Bluetooth is supposed to have installed Godebald in Scania “to educate”. Godebald came from England and it is said of him that he had preached in Sweden and Norway. As Godebald did not come from Germany, Adam of Bremen does not mention him further. For Adam it was important to oppose everything which posed a threat to the ecclesial position of Hamburg/Bremen in Scandinavia. On the Germans´ list of Scania´s bishops Godebald does not figure. The oldest catalogue of the bishops should, according to Adam,look like this: ” The first Bernhard, the second Henrik and also Egino ”. 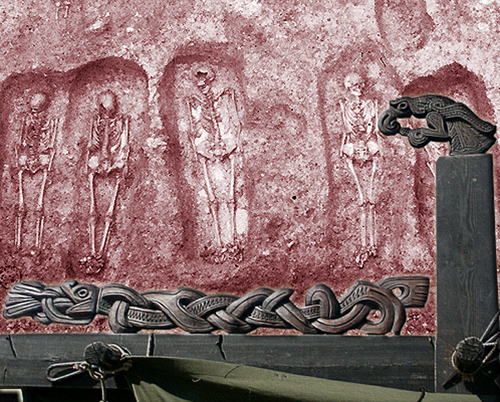 In the death book in Lund´s cathedral, the so-called Necrologium Lundense from the 12th century, we probably see a more truthful version. Here it says that the Englishman Godebald was the first bishop in Lund. Who was the second bishop then, Bernhard? Like Godebald, Bernhard came from England. Knud the Great, who died in 1035, inaugurated him as bishop in Scania. The archbishop in Hamburg/Bremen was certainly displeased with this choice, but after Bernard personally “did penance”, i.e. subjected himself to the bishop as his spiritual leader, he received gifts of friendships with the permission to set forth as a bishop. The English bishops in Denmark did not have an easy time, apparently. If they did not voluntarily go to see the archbishop in Bremen, they could be exposed to violence. It is said of bishop Gerbrand in Zealand, whom king Knud had sent for in England, that he was taken prisoner by the archbishop Unwan in Bremen, who forced him to swear an oath of alliance and thus betray the English archbishop, who had been his master. Aelnoth was the archbishop of Canterbury in the years 1020-1038. In the year 1104 Lund became the archbishopric for all of Scandinavia. The area was thus eliminated from Bremen´s/Hamburg´s archbishopric. However, the thoughts of a sovereign Nordic archbishopric seem to have been planned half a century earlier. In earlier research we have traditionally seen these attempts from the reigning Danish king, Svend Estridsen, as an expression of a hostile relation between Lund and Bremen. The sources, however, provide the opportunity to see this circumstance quite differently, which would clarify many strange events, among them the new division of Denmark in dioceses, which was carried out by the king in the year 1060. Everything probably began with the close collaboration between Sven Estridsen, the archbishop in Bremen, Adalbert and the German emperor Henrik III. As early as 1052 king Sven met with Adalbert in Slesvig. The following year Sven visited the German emperor in Merseburg and even celebrated Easter with him there. There is no doubt that close relations these three rulers had come into existence. The three must have made a draft for a plan for the organization ot the church in Northern Europe. In the year 1053 Adalbert received a papal bull, which made him the pope´s envoy and deputy in all of the North, including Iceland, Greenland and Finland. The next step was to have Adalbert appointed patriarch and install an archbishop in Lund. He was to be under the orders of Adalbert, not the pope. To make the patriarchate succeed, the ecclesiastical court ruled that there had to be 10-12 subjugate bishops and a people, who had recently been converted to Christianity. In Germany only two bishoprics came under Bremen. The object was to set up the others in Denmark. This happened in the year 1060, when Sven Estridsen, certainly in agreement with Adalbert, set up several new bishoprics in the dioceses Slesvig, Ribe, Aarhus, Vendsyssel and Viborg. In Funen Odense became the bishopric, while Roskilde was kept as a diocese for Zealand. In Scania Lund and Dalby were added. With this large re-organisation the king and the German archbishop had made the foundation for the pope to establish the patriarchate. It is interesting that Dalby in Scania became an bishopric. The geographical situation of the place is quite impossible, in the light of the fact that it is very close to Lund. However, if you look at the premises for establishing a patriarchate in Bremen, the pieces of the puzzle fall into place. Egio was installed as the bishop in Dalby and he functioned as a mission bishop according to Adam of Bremen. Adam describes Egino´s work with converting other peoples to Christianity thoroughly. He crusaded against the Blekings and helped the church in Skara in western Gothland against pagan rebellions. Dalby thus seemed to have functioned as a base for a mission bishop, whose area not entirely was part of the Danish main area. Adalbart thus enlarged his planned patriarchate with the areas and the peoples outside Denmark, who had not been christianized. The formal demands for a patriarchate seemed to be more than met. Next step was to convince the pope. Is it not in this connection, we must view Adam of Bremen’s extensive script from the 1060´concerning the conditions in the North? Adam must have been sent out by archbishop Adelbert to Sven Estridsen, the archbishop´s friend, in order to get the necessary information for his book. He describes in detail the vasts area in Scandinavia, where the pagan belief still ruled, but also with his starting point in Bremen/Hamburg how they systematically worked to convert the population in this area to Christianity. Adam´s unique work may therefore be the oldest, known commissioned marketing of the North in general and Scania in particular. Maybe the intent was for the content to be seen by the pope. In the year 1072 bishop Egino travelled to Rome. For the first time a Nordic bishop visited the court of the pope. Egino had taken over the bishopric in Lund six years earlier. It is not that far off to assume that Egino´s journey to Italy is to be seen in connection with the founding of the patriarchate. However, Egino died just after his return, almost at the same time as archbishop Adalbert. Two years later, in 1074, king Sven died. The main characters behind the German patriarchate with an archbishopric in Scania, had suddenly disappeared. King Harald Bluetooth conquered large parts of Scania in the 970´s and in all probability introduced Christianity by force. A hundred years later it is mentioned that Scania alone had 300 churches. In the 1060´s there were also two bishoprics in Scania. One in Lund and the other one in Dalby only 15 kilometres to the east. Under the strong bishop and missionary, Egino, there were merged into one for the bishop. Thus the foundation was laid for Lund to become the leading ecclesiastical town. As early as the time of the king, Sven Estridsen, in the middle of the 11th century, the first stone church was built in Lund. Under his son, Knut, the economic basis for a new cathedral was made. For a long time the Danes had worked to have an archbishop in Lund. However, as the North fell under the archbishop in Hamburg/Bremen, the goal was to get the pope to approve of this reform. They succeeded in 1104. At that time, the building of the cathedral in Lund had gone on for a long time. The cathedral in Lund is Scandinavia´s most magnificent edifice from Roman times. The building of the church went on from the 1080´s to 1145, i.e. from the end of the Viking Age to the beginning of the early Middle Age. The oldest part of the cathedral is the enormous crypt under the high altar. Here we find the famous Finn sculpture, a human-like being, who embraces a stone pillar. The pillar originally was placed somewhere else, probably in Sven Estridsen first cathedral. Finn is thus a ”genuine” Viking.